I’m going to give you something because my blog is about 15 months old. My blog turned one year old in September. I didn’t do anything about it because I’m just as bad about blog anniversaries as I am about other kinds of anniversaries. I kept thinking about needing to make a post about it and then I didn’t do it. So now I’ve decided to celebrate that Cannibalistic Nerd is roughly 15 months old (I’m too lazy to actually figure it out). So much has happened over the last 15 months – I caught up on Downton Abbey, I’m pretty sure I had the biggest zit on my face ever (it had three levels), and I ate fried girl scout cookies for the first time. A bunch of other stuff happened but those are the real highlights. Most importantly, though, I’ve met some great people and have enjoyed reading their blogs and conversing with them over Twitter and other such social media media. While I write about a lot of stuff (ALL IMPORTANT), the thing I do every week is make fun of The Super Friends. While I’m pretty sure my deathbed regret will be that I spent so much time watching and writing about this show, for now, it’s what I do. To commemorate 15 months of whatever the hell all of this is – I’m going to give two of you something. The first name I draw (from the comments) will get to pick one and then the second name is stuck with wins the other. 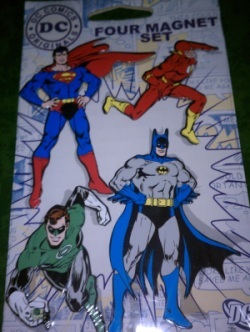 If you are a grown adult who doesn’t like superhero memorabilia (weirdo), just say so and I will spare you. Notice they swapped out Aquaman and Robin for Flash and Green Lantern – why ever would they do that? Wanting to display your enemy list on the fridge but don’t have a magnet to get the job done? Well, now’s your chance to strike fear in the heart of your enemies if you have them over to your house. They’ll see their name on the list, then see you have the help of a superhero to strike them down. Just in time for Christmas! To enter to win one of these two groundbreaking prizes, all you have to do is leave a comment. You can make up a fake wonderful memory about me, or share what super power you would choose, or just type “farts;” pretty much anything other than telling me not to give you a prize will make you eligible to win. And then, a week from today, I’ll draw the names, and two of you will have your lives changed forever because I remembered my blog has been around for over a year. In conclusion, it’s been a fun 15 months – here’s to however many more months I feel up to it! Farts and burps to you, my special friend. I never win anything but I would give you my thumbs for that lunchbox, which would make it REALLY HARD TO TEXT. Give it to me. Now. Also, thanks for all the laughs. We need those. You’re very welcome. You know this means you’re gonna get stuck with the magnets. I’m not so into the superhero friends saga, but I do love your blog and your humor, ergo I enjoy you in a non-creepy way. Yea for 15 months! I enjoy reading your blog because you make me laugh. Thanks for that. Congratulations on the 15 months! I think my favorite memory of you is when you quarterbacked our team to the state championship despite having the flu. That was awesome. OMG! Yes! That was right before you invented Gatorade. My flu inspired you. 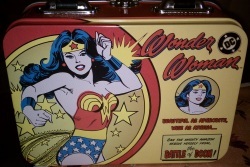 Oh, lunchbox, how I want you. Also, farts. Just because I want to say it. Can my superpower be saying “farts” in people’s blog comments? NAILED IT. You brought it all back around. I’m impressed. Happy 15 month anniversary!!!! That zit sounds amazing. It really was. It left a scar, too. A 3 level zit?? How did I miss the blog post on THAT?? I don’t know how I will choose between those 2 prizes WHEN I win. Do I go selfish and pick the lunchbox? Or feel all holiday spirity and shiz and give the magnets to my kids? Damn. So tough. Well, in a way, when you pop a zit, it’s kinda like it’s farting. I didn’t write a post about my three-level zit. Someday I hope to write an epic post about my acne that will inspire millions, for some reason. Merry 15 months! I do enjoy the weekly Super Friends Synopsis, but it’s taken a back seat to your unspired series. Thanks, Vesta. Super Friends is a lot more work, Uninspired is based off of my knee-jerk reaction, which is conveniently quick. There should be no regrets about spending time watching and reviewing Super Friends. It is both a Saturday morning tradition and a public service of awesomeness. I’ll try and remember that during my fevered deathbead confessions. It doesn’t disqualify you unless you want it to. It sounds like you need something to manage that list with, though. Oh what I could do with an enemy list. The fact we share an odd but committed fondness for the Superfriends 70s tv show means that if I ever need a brain transplant I can accuse you of having something I want immediately. Saturday superfriends are the consistent highlight of my week. I hope wonder woman does something cool this next episode. Keep ’em coming zit face…wait sorry, Carrie. If anyone’s going to do something cool, it’ll be Wonder Woman, and there’s about a 30% chance of that happening, I’d estimate. Thanks for being a pal, Lance. WAIT! You ate fried girl scout cookies? Did I miss that post? What kind of cookies? I did! It was at the state fair. I can’t even remember if I mentioned it. They were Samoas or however you spell them. They were quite good. I WOULD say that I’d love the magnets, but I’m kind of offended that they swapped out Aquaman because (shhhhh, don’t tell) I am actually one of the few people who actually dig Aquaman. I even have an Aquaman shirt that I wear frequently, even though the other nerds make fun of me. I wanted to be an ichthyologist when I was a kid, so it just made sense. And dude! He can summon dolphins! What girl in her right mind wouldn’t love that?!? Aw, you like Aquaman! That’s ok. I have a fondness for him too, but in a “he’s such a loveable doofus” kind of way. I think my favorite memory of you has to be the time we never went to that place and you didn’t do that thing that obviously never made me react the way I didn’t. Ahhh…memories…who can forget ’em? Me, apparently. I can’t believe I don’t remember that. THAT I remember. We need to finish writing that.